Jodhpur is an Indian city located in the center of Rajasthan. 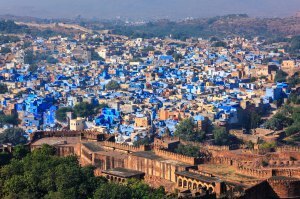 It is also the second largest city in the state with 1,140,000 inhabitants, and is often called the "blue city" because of the houses of the old city painted in this color, to protect itself from heat and mosquitoes. Visitors enjoy several sites in Jodhpur, the most important of which is the Mehrangarth Fort, magnificently carved, the emblem of the city it dominates, and which can be reached on foot after taking the winding alleys of the old city, to admire from above the superb panoramic view of Jodhpur; the interior of the fort is also worth a visit, thanks to its colorful stained glass windows, small courtyards and arcades. To see then, the clock tower, a landmark separating the new town from the old, with around its spice shops and tea merchants, as well as its fabric stores; the Umaid Bhawn, palace where the royal family still lives; the Sardar Bazar, the market that surrounds the clock tower, where you can buy fruits, vegetables, clothes, and other things; the Toori Ka Jhalara, a 30m deep well in the city, accessible by a multitude of steps, where the Indians sometimes dive. The best time to visit Jodhpur is between October and March. Jodhpur is reached by bus or train (the city is on the Jaisalmer / Delhi railway line). To get around the city, the rickshaw is the most convenient solution over short distances, for longer trips you will easily find taxis.